Hollow “cow-cow-cow-cow, cow, cow, cowp, cowp, cowp” heard mainly in breeding season. Description: Sexes similar. 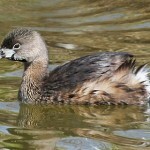 Breeding adult is brown overall, with black ring around stout, whitish bill; black chin and throat; pale belly. Winter birds lose bill ring; chin is white. 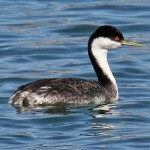 Juveniles resemble winter adult but throat is much redder; head and neck streaked with brown and white. Habitat: Breeds on ponds, lakes and impoundments with emergement vegetation. Migrants can be found on lakes, reservoirs, marshes, ponds and water- filled ditches. Where in Nebraska: Common migrant statewide; Common regular breeder in the Sandhills and fairly common breeder elsewhere. Largest breeding concentrations can be found on Sandhills marshes in Sheridan, Garden and Cherry Counties. Field Notes: Nests are constructed on semi-floating masses of plants standing in water; eggs in the nests are frequently lying in water. 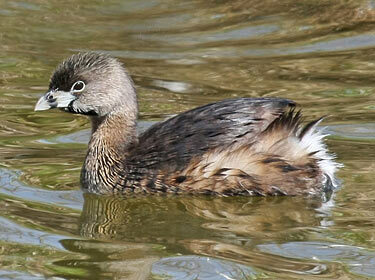 Fun Facts: Pied-billed Grebes are rarely seen in flight and when threatened or flushed by predators prefers to dive underwater than fly away. 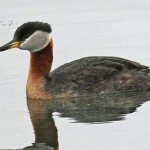 Additional Information: Other grebes have slender bills.